Is it a toy? A 3-D coloring book? Furniture? A sculpture? A little of all of the above? Who really cares about defining it. What really matters is that it is PAPER. That's right. This awesome play house that is almost too cool to let your kids play in (No matter how tempting it is, DON'T COLOR ON THE WALLS! 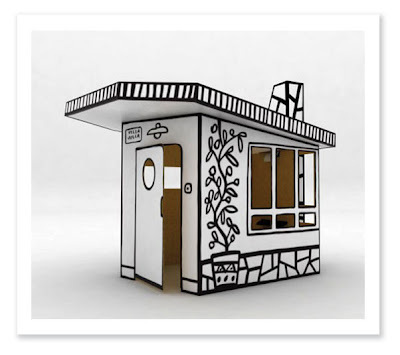 ), is constructed of cardboard. Simply awesome. Hey Javier, does the Villa Julia come in my size? ?